Alberta’s old Environment Minister gets new job defending coal power because hey, why not? The man who used to be in charge of Alberta's climate change strategy has a new job: defending coal. The man who used to be in charge of Alberta’s climate change strategy has a new job: defending coal. The Coal Association of Canada just announced it’s hired former Progressive Conservative Environment Minister Robin Campbell to be their new president. “Mr. Campbell understands the issues and challenges facing the coal industry and is well-positioned to be an effective voice in promoting the value of the industry in Alberta and across Canada,” CAC Chairman John Schadan said in a non-ironic statement released to the media. Campbell was also praised for his “track record.” In 2014, Campbell announced a new energy efficiency program that never actually materialized. 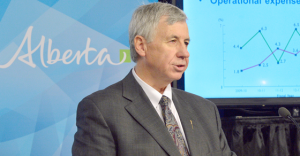 Alberta’s auditor general previously blamed Campbell and his ministry for failing to report on its own greenhouse gas reduction strategy six years in a row. “Ministerial oversight has been lacking because good oversight would have insisted on there being good results reporting,” said Auditor General Merwan Saher at the time. 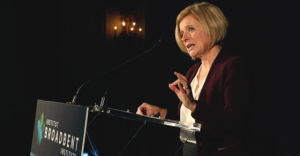 Alberta Premier Rachel Notley announced she will be accelerating the phase-out of the province’s coal-fired power plants in an effort to meet Alberta’s climate targets. Photo: Government of Alberta. Used under Creative Commons license. Alberta's old Environment Minister gets new job defending coal power because hey, why not? Alberta Premier Rachel Notley took square aim at the myth that only conservatives get how to manage Canada's resources. Conservatives like to present themselves as the energy industry’s best friends. Speaking at the Broadbent Institute’s 2015 Progress Gala, Alberta Premier Rachel Notley took square aim at the myth that only conservatives get how to manage Canada’s resources. “Conservative governments in Alberta and in Ottawa claimed to be pursuing policies in the interests of the energy industry,” Notley said.